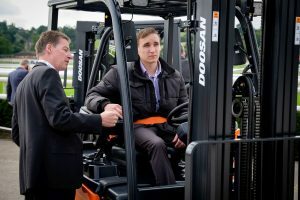 Doosan Industrial Vehicle UK has launched its new range of 1.5 to 2.0 tonne electric forklifts, bringing a step change in performance and value to the UK market. 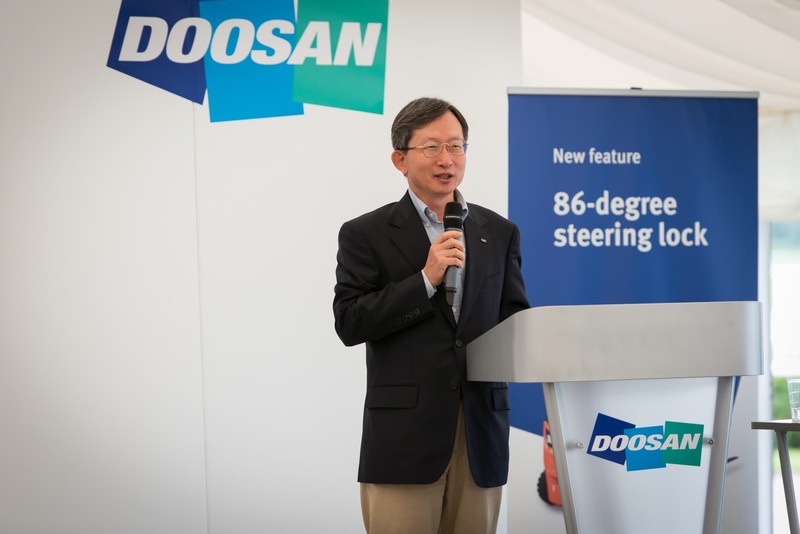 At a launch event at Uttoxeter Racecourse, Dr KB Park, Doosan Industrial Vehicle’s Executive Vice-President and CEO, introduced the “beautiful” new range to the company’s UK dealer network. 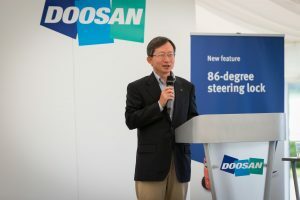 He stated that the new three and four wheel vehicles will enable Doosan to grow its market share by setting a new benchmark for electric trucks in four key areas: productivity, ergonomics, safety and serviceability. According to BITA’s authoritative forklift industry sales statistics, 37% of counterbalance trucks sold in the UK last year were electric – a trend that is increasing due to an increased focus on emissions from companies buying forklifts. Electric trucks are especially popular in the food and drink, retail and distribution sectors. One example of the radical upgrade the 7-Series trucks represent compared to their predecessors is the newly-designed steer axle. This means the four-wheel B18X-7 now turns to 86 degrees, reducing the forklift’s turning radius by 160mm to just 1795mm. This is more than 100mm better than the equivalent models from most competitors and such manoeuvrability will improve productivity and reduce damage allowing operation in much narrower confines than before. A significant boost for on-site productivity also comes in the form of the new side lift-in lift-out battery change system. Allowing batteries to be switched quickly and safely using only a simple hand pallet truck, this is ideally suited to extended double or triple shift operations and vastly decreases downtime when changing batteries. As well as increasing the speed of the battery change operation, it also increases the safety levels and one that takes the manual handling issues of roller-based systems out of the equation. Built at the company’s state-of-the-art production facility in South Korea, Doosan now has the most modern and one of the widest ranges of electric counter-balance trucks, including the giant 4.0t, 4.5t and 5.0-tonne models, which suit any electric truck application. New standard features include an automatic electric parking brake and advanced control system protected to IP65 rating, giving even better protection against water, dust and damp sites. Other highlights include LED spotlights for better illumination but using less power and vastly reducing bulb failures, upgraded protection packages on the motors, virtually maintenance-free oil cooled disc brakes, Active Energy Control with regenerative braking, which feeds power back into the battery extending the shift-life, and the Operator Sensing System for ultimate driver safety. The 1.5 to 2.0 tonne range is available now. 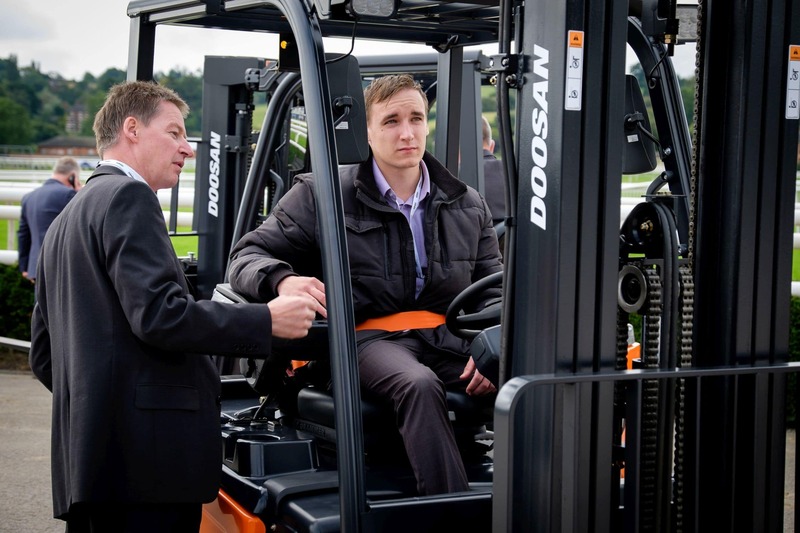 Production begins in January on Doosan’s 2.5 tonne models.